Oaklawn School fifth-grader Karlen Knospe found it fascinating to walk through UW-Stout’s Research Day in the Memorial Student Center. 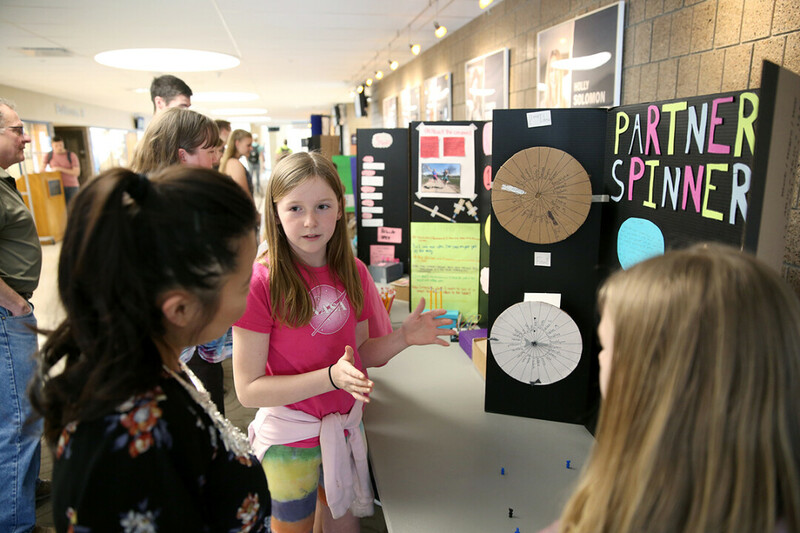 Knospe was one of 22 fifth-grade students from Menomonie who attended Research Day in May and shared their team research projects. Knospe and Ava Webber presented their research on creating a kindness generator. The idea was that a student would be picked each day to use a computer to randomly generate a kind comment and the name of a classmate. Students plan to have the kindness generator up in their classroom soon. Teacher Matthew Wigdahl said this was the second year Oaklawn students shared their research at Research Day. He called it a tremendous benefit to the younger students. Fifth-graders also had the opportunity to see collegiate research projects. “They are able to interact with the college students on a different level,” Wigdahl said. “They can talk about how to input code (into circuit boards) and able to get ideas to improve their research. Devin Berg, UW-Stout program director for mechanical engineering and an associate professor, goes into Wigdahl’s class and introduces students to using circuit boards and doing research. Berg said part of his goal is to encourage students to consider science and technology careers. Some of the Oaklawn students researched how to program a model robotic arm. They used a 3D printer to build the robotic arm. “I learned coding is hard,” Micah Gunderson said. Brooklynn Birt said she enjoyed seeing the college students’ research. “It’s just super that we get to meet people and learn how they control their studies,” Birt said.